“On Vidovdan, year 1389, Serbian tsar Lazar came to Kosovo with his brave army, on the frontier of the Christian Europe, and in order to defend the Christian culture, he gave his life. At that time there were as many Serbs as Englishmen now. Today, there are ten time less Serbs than then. The Serbian people were once like the Israelis today– defiant, fierce – fearless fighters. 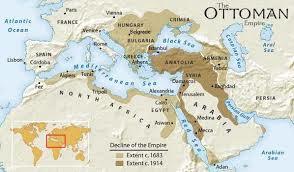 Like the land of Israel, Serbia suffered many centuries of Islamic-Turkish occupation. Generation, upon generation of Serbs led lives of unimaginable sacrifice and depravation as they sought to liberate themselves from Islamic enslavement. The Serbian resistance lasted, not years, not decades. It lasted Centuries. 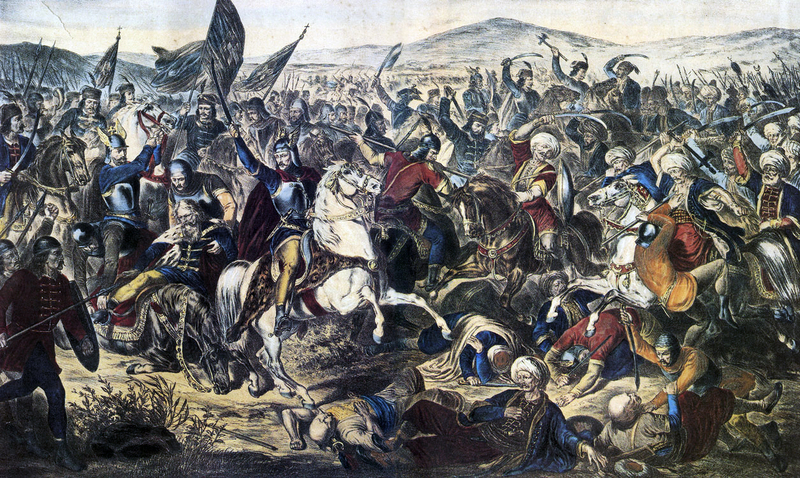 Unlike the fascist fabricated claims of Albanians and Arabs who cynically renamed themselves ‘Kosovars’ and ‘Palestinians’ respectively to usurp the identities of their victims, to disguise their illegal land grab of Kosovo and Judea and Samaria, theirs, that of the Serbian people is an experience, a history of real occupation, of true resistance — and eventual liberation from Islamic tyranny and terror as a subjugated people. Frustrated Turkish overlords, faced with an unyielding proud people, erected a gruesome tower in the Serbian city of Nis built from Serbian Skulls; It still stands. In 1916, Bishop Nikolaj Velimirovic recalled that tower, hoping to shed light on the horrors suffered by his people under Islamic imperialism for five centuries when he spoke at Saint Paul’s Cathedral–seeking, somehow, to awaken an awareness in his distinguished audience of that which was endured by the Serbian nation — the extraordinary, truly epic sacrifices they made that kept the rest of Europe free. Today former Turkish Prime Minister and now President Recip Erdogan, declares that much of the former Yugoslavia, indeed most of the Balkans, is a part of Turkey, as well as Jerusalem, in clear reference to a revival of the Turkish- Ottoman Empire. Why are Western leaders not only embracing a revival of this violent tyranny, but promoting it by supporting not just Turkey, but Iran, Qatar, and the Muslim Brotherhood? Perhaps it is the same reason Hitler himself did when he financed the genocidal efforts of the leader of Palestinian Arab movement: Haj Amin Al-Husseini. Perhaps it is because is affords absolute control over virtually all facets of human life; it silences dissent under penalty of torture, and death; it requires complete submission to authority, and absolute obedience; it prohibits critical thought and analysis, institutionalizes violence, sanctions the brutal subjugation of women, provides for the unchecked exploitation of labor — including child labor — free of all safeguards, redress, or the establishment of unions whether in the factory, the field, or the construction site of a football stadium, say in Qatar. It is rule by terror and torture, divinely sanctioned — not law. Read these stark, chilling words of Bishop Nikolaj uttered almost 100 years ago — eerily familiar and no less relevant today. 27. June 2014 – 14:50 On June 28th 1916, now Sainted Bishop Nikolaj Velimirović addressed a congregation gathered at St. Paul’s Cathedral in London at the invitation of the Archbishop of Canterbury. Gentlemen and friends,I am coming from Serbia, from European “midnight”. There is no ray of light, not a single trace. All the light went from the ground to the sky and the sky is the only place where the light is coming from. Nevertheless, we that are weak in everything are strong in faith and hope that dawn will soon arrive. I am grateful to Lord Archbishop, Randall Cantuar, that allowed me, on this holy day, Vidovdan, year of Our Lord 1916, in this beautiful church of Saint Paul, to address his majesty, King George V and the most prominent Englishmen. Gentlemen and friends! I spent the whole day yesterday looking at this magnificent temple, which is the pride of England and Christianity. I have seen that it has been built by using the most expensive material, brought from various parts of the empire, where the sun never sets. I have seen that it has been built from granite and marble, that the waves of the hundreds of seas and oceans rinsed them to the shore. It is also decorated with the gold and precious stones, which were brought from the most valuable mines in Europe and Asia. I have convinced myself that this temple is accounted for the one of the architectural wonders of the world for a reason. However, my friends, I am coming from a little country in the Balkans, and there is a temple that is bigger, holier, and more beautiful and precious than this one. 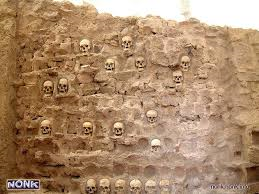 That temple is located in Serbian town of Niš and its name is the Skull Tower. That temple is built from the skulls that belong to my people. They have been standing there for five centuries, like a stout dam for Asian sea, on the Eastern European gate. And if all the skulls and bones were used to build the temple, that temple would be three-hundred meters tall, with identical width and length, and every Serb could have come in today, raise his arm and point at each one of them “This is the skull of my grand-father, my father, my brother my neighbour, my friend, my God-father, my best man”. For five centuries, Serbia has been defending Europe with it’s bones and skulls, so Europe could live peacefully. We made the Turkish sabres blunt with our bones; we threw down the savage hordes that were rushing down like a mountain whirl wind towards the Europe. Not for a decade, nor for a century, but for all those centuries between Rafael and Shearer. During all those “white and red centuries”, while Europe was experiencing religious reformation, scientific revolution, political revolutions, work reformations, the reformation of the overall way of life, using words, we carried out our role with our lives. While Europe was heartily revising gods and people from the past, and while it was going through a purgatory both physically and spiritually, we, as patient slaves, were slaughtered by the European enemies, forbidding the entry into that same purgatory. In other words, while Europe was becoming Europe we know Today, we were its fence, the impenetrable wall, and the wild thorns around the gentle rose. On Vidovdan, year 1389, Serbian tsar Lazar came to Kosovo with his brave army, on the frontier of the Christian Europe, and in order to defend the Christian culture, he gave his life. At that time there were as many Serbs as Englishmen now. Today, there are ten time less Serbs than then.Where are they? They died, protecting Europe. Now it’s Europe’s turn to pay back the debt. Tags: 'árabes palestinos', Communists, genocide, Germany, Holocaust, Iran, Israel, Israelis, Jerusalem, Jews, Kosovo, Muslim Brotherhood, Nazis, Nis, occupation, Ottoman, qatar, resistance, Saint Nikolaj, Sainted Bishop Nikolaj Velimirović, Serbia, Serbs, Skull Tower, St Paul's Cathedral, Turkey, Turks, World War II, Yugoslavia. Bookmark the permalink.